Please remember from C. The Cause of Gum Disease, when the gums are infected they detach from the teeth and form the probing depths that are deeper than 3 millimeters. 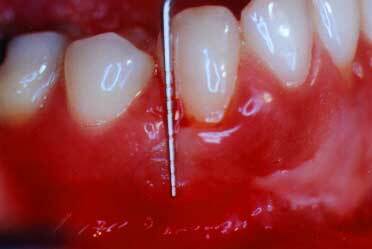 The following case types will show probing being done and you will see the silver periodontal probe. 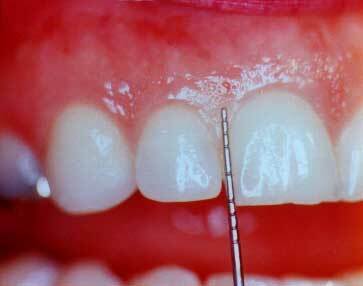 Healthy gums look healthy and probing in the "ditch" or "sulcus" only goes to a depth of 1-3 millimeters. 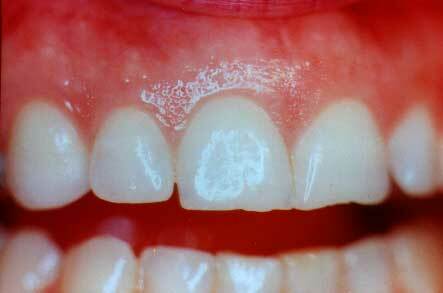 Diseased gums show changes in color, form and texture and show a probing depth deeper than 3 millimeters. You can see the "coral pink" color, the form where the gums fit in a nice sharp tapered point between the teeth, and where the "stippling" exists. 2. 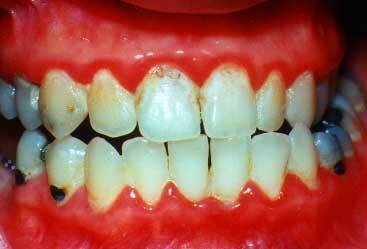 What is the Appearance of Gum Disease ? 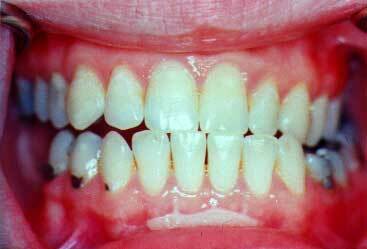 Periodontal disease or gum disease looks different in different patients' mouths. 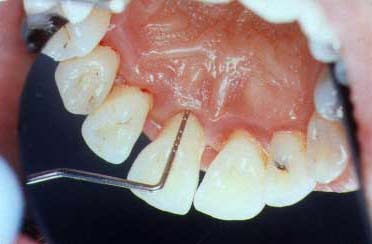 However, changes in color form and texture are good visual clues to look for when you are looking for the presence of gum disease.These next photos will show how a deep pocket actually appears. The gum tissue has changes in the gum tissue color and form. There is some yellow pus on the gums where the periodontal probe will be inserted in the next photo. You can see how deep the probe did actually go into this diseased pocket. This is approximately 8 millimeters and shows how much bone loss has occurred. Non-surgical therapy is called root planing. Root planing is where the gum tissues are usually anesthetized with a novocaine anesthetic and the dentist or hygienist will scrape the diseased tooth root until it is clean and no longer contains bacterial waste products. 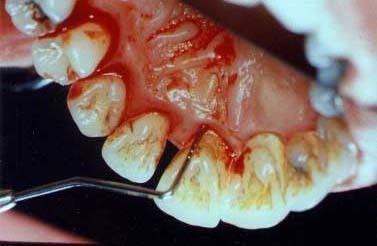 Root planing may sometimes be enhanced with antibiotics that are taken orally or placed into the gum "pockets". Not all cases of gum disease will have antibiotic enhancements as a part of their root planing therapy. After root planing, the gum tissues are usually tender or sore, but not usually painful. When the periodontist determines the gum disease aggressiveness, the periodontist can determine the modifications in the root planing treatments that best fit your case. Here you can see the silver periodontal probe which goes 5 mm. into the pocket. There is much bleeding and infection present. The gum tissues are pink in color and there has been some tissue shrinkage. The gums are healthy with a probing depth of 3 mm. Gum surgery is done to eliminate diseased pockets which still exist after all healing has been achieved following non-surgical root planing. There are however a small number of cases which will not benefit from non-surgical root planing and surgery will be recommended without having root planing done. Surgery is most frequently done with a novocaine local anesthetic. A periodontal dressing may be placed after the surgery in order to protect the tissues. There may be some pain after periodontal surgery. 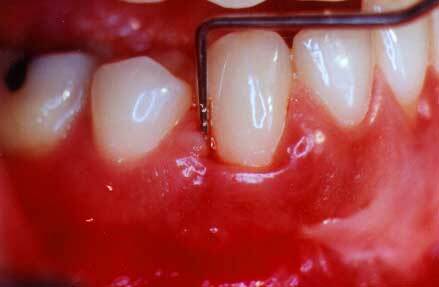 When surgery is done and diseased tissue is removed, the teeth will usually have more root surface exposed. This amount of exposure represents the amount of root surface which lost its gum and bone support from the gum disease. The surgery is not causing unnecessary damage. 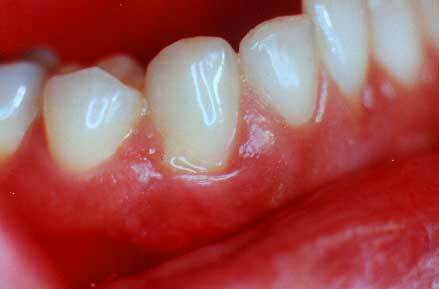 This view shows very inflamed with changes in color, form, and the presence of recession between the teeth. Gum surgery will be needed because root planing alone cannot make her gums healthy. The gums are now healthy. The pink color and restored contours are evidence of that health. She can now maintain her teeth for all of her life.